G’day folks – I thought I’d send today’s not as it has a lot in it and there are some important points markets are at. You’ll also see there are some changes I’ve made recently where I talk more directly about what my positions are and what I’m doing. Even though this is not a signal service I thought it improves things a little. Anyway, enjoy and if you’d like to subscribe email me at greg@gregmckenna.com.au and I’ll reopen the launch special for the next 24 hours. Cheers and I hop you are all well. Stocks drifted a little as bonds rallied and oil markets stalled. That could be important. At the close the S&P 500 was down 0.2% at 2,731. The USD continues to march higher and is at 96.39 in DXY with the Euro and GBP a little lower as Donald Tusk says there is a ‘special place in hell’ for the Brexiteers who tipped the UK into this mess without a plan. And of course the Aussie dollars woes continued in European and US trade both against the USD and on the crosses as traders bet the chance of a rate cut is real given the housing price falls. You’ll see in the body of today’s note that bonds and oil seem to be telling a different story to stocks. That doesn’t mean sell per se. but it is a handbrake on the rally as we’ve seen the past couple of days. So at the close besides the S&P 500’s 0.2% fall we saw the Dow down 0.1% to 25,390, the Nasdaq 100 was 0.4% lower at 6,997, while the Russell 200 dipped 0.15% to 1,518. Small bikkies I know and far from the end of the world. But just watch this space – as momentum slows the chance of a reversal grows. European stocks were lower as well. The FTSE consolidated its break closing essentially unchanged at 7,173, the DAX was 0.4% lower on more weak German data with factory orders for December collapsing 1.6% against expectations of a 0.3% increase. They are now down 7.4% year on year. The CAC dipped just 0.1% in Paris. In Australia though we found 20 points of gains yesterday and PSI traders added another 18 points overnight. We are nearing some decent overhead resistance though as you can see in the chart below. On forex markets the Aussie and Aussie crosses were the standout after RBA governor Lowe put rate cuts on the table. So the AUDUSD is off 1.63% now at 0.7115, the AUDJPY is off 1.6% and we’ve even lost ground against the Kiwi which is at 0.6826, down 0.97% after being caught in the Aussie’s tractor beam. Elsewhere the Pound did reasonably well given Donald Tusk vitriol – its at 1.2934 down just a smidge. Euro is down 0.44% after the data at 1.1363 and USDJPy is largely unchanged at 109.96. USDCAD is up again at 1.3206 for a 0.6% gain while the 0.3% lift in USDSGD confirms the USD breakout. On commodity markets gold has dipped 0.66% in the wake of USD strength and is back at $1,306.20. Silver is down 1.2% at $15.65 but copper remains bid with a gain of 0.6% to 2.834 – it did reverse off the range top though. Bitcoin is falling and is near $3,300 while WTI and Brent are both a little higher and not ready yet to rollover it seems. WTI is up 0.6% to $53.98 while Brent lifted 1% to $62.63. US 10’s are at 2.70% after a good auction Wednesday. The 2’s are at 2.53% and the curve is at 1.80 points. On the day today we have Kiwi employment, unemployment and labour cost data around the time you’ll be getting this note. Then in Australia we have the AiGroups performance of construction index which – because of concerns about housing and Governor Lowe’s speech yesterday – will garner more interest than normal. The last print was 42.6 so it’s already in a parlous state and you’d hope not falling further. In the US we hear from Fed vice Chair Rich Clarida, we get jobless claims and consumer credit. And Fed Chair Powell si on the docket as well. On trade. Is a deal possible? I genuinely wonder if a trade deal is possible given the necessity to break a number of China-US battles away from each other in order to get a deal. Here’s my current thinking. There is a clear assumption that President Trump will prevail with a trade deal. Indeed yesterday Reuters reported “US’ Mnuchin, Lighthizer to hold talks next week in China: sources”. And the only answer to that is which US face is going to present in China – Mnuchin ‘want to make a deal’, or Lighthizer, ‘you folks are cheats’? So of course I tweeted in response to the story “No doubt they’ll hold talks between themselves – or play rock-scissors-paper – to see who wins Mnuchin conciliation or Lighthizer hard ball”. To this end, markets have assimilated a deal – they seem to believe that President Trump wants a deal and one will be forthcoming. I have written something similar though questioning the path to which the US can detach the hegemonic and technological battle from Soybeans. But as Bloomberg points out yesterday President Trump said in his SoTU speech that a trade deal must include structural change in China. “I have great respect for President Xi, and we are now working on a new trade deal with China,” the President before adding “it must include real, structural change to end unfair trade practices, reduce our chronic trade deficit, and protect American jobs”. Hands up if you think that will happen…Beulah, Beaulah???? Indeed, that’s Lighthizer, not Mnuchin. HSBC School of Business, Peking University, Shenzhen. If you don’t follow him you must – here’s the link. And when you see stories like this where the Alcoa CEO says the Aluminium market is being hurt by the “sucking sound” of production being dragged toward China because of state subsidies you have to wonder if a deal can get done. Roy Harvey told Bloomberg, “that playing field simply isn’t level. And that in turn means that you’re getting this sucking sound of productive capacity, and now semi-fabricated products, into China. You’re pulling more and more of that primary demand back into China, and it’s only a gain for the Chinese”. Politically it might actually be better for the President to prosecute this argument a little longer. Particularly as the Democrats move further to the left. That’s something Fox Business’ Charlie Gasparino said Wall Street Democrats aren’t and can’t support. Brexiteers – where is your place in hell. We have Irish Republicans telling Mrs May that a no-deal Brexit means a referendum on Union between the North and the South, we have the DUP still saying it won’t stand for the Irish backstop, we have the Irish Prime Minister saying we’ll never need it but because Westminster is so dysfunctional we still need to have it in writing AND then we have EU President Donald Tusk going straight for the jugular. 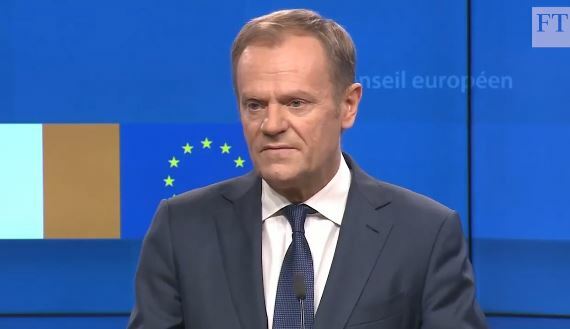 He said once again the agreement is not up for negotiation but added, “I’ve been wondering what that special place in hell looks like, for those who promoted Brexit, without even a sketch of a plan how to carry it out safely”. Now, for Mrs May to pull a rabbit out of the hat with her meeting at the EU Thursday. Oh, if you are interested in seeing Tusk say the words, click on the caption. Are bonds and oil sending stocks a message? I’ll just leave this chart here as a reference. But I do wonder if the stocks recovery can continue while oil price rises stall and bond rates fall. Now of course I still think the 2.55/2.82% zone for the 10’s is the Goldilocks zone where rates will not cruel the rally. And it is equally true that when a crisis/market funk passes assets that were correlating to 1 diverge again. That’s actually healthy. But when you look at the chart above you have to wonder. Something for us to keep our eye on. With regard to the above if there is a place for a bit of a pullback for stocks maybe today’s candle on the S&P 500 futures and physical is an indication. Indeed these types of candles have been inidcative in the physical market of a dip a number of times since the high. We get less of them in the futures market because it is open almost all hours. 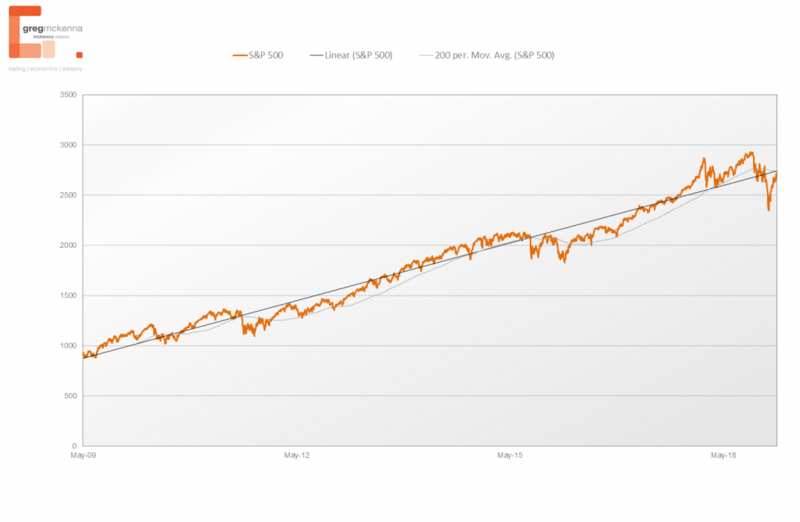 So for me, the 200 day moving average might be it. Especially given we are back retesting the underside of the very long term trend at the moment. It is important to note that for my MACD system I do not have a signal. What’s faster than a speeding bullet or a Powell Put turnaround? The back flip that RBA governor seemed to do today in softening the market’s understanding of what the RBA REALLY meant yesterday with his statement after the Board meeting and decision to hold rates at 1.5%. Although it was a back flip at all really was it. It was a clarification in the same manner that NY Fed President John William’s clarified Powell’s comments after the December 2018 FOMC press conference. Indeed in this morning’s (yesterday’s now) newsletter I said I thought that Governor Lowe would be “positive, but also more dovish than folks reckon after yesterday’s reaction to the statement”. And that’s what we got, glass half full, but with equal waits of optimism and caution. And that is dovish if you think housing is going to weigh on the Australian economy. So they aren’t going to cut in a hurry or unless necessary. Watch unemployment. This is a data dependent central bank – like the others. The USD is breaking higher. We are not there yet but 96.65/70 is looming as a very important delineation point for the USD rally. That’s because it is both the 61.8% (96.68) retracement level of the most recent rally as well as the recent high before the recent reversal back toward 95.00. That 95 held is clearly a good sign for the Greenback in these terms and it is of course analogous to the Euro faltering above the 1.15 level again and Sterling running out of puff back above 1.32. Of course the DXY is a derivative (or at least a calculation) of these moves so that makes sense. A break of 96.70 would be bullish for a 1 big figure run toward the recent range top and that would have implications for the other currencies against the USD – that’s market reflexivity for you. The corollary of the DXY move is the Euro is dipping lower again as well. It’s now below the cluster of support from the 3 moving averages and the SAR has flipped to a short. 1.1355 looks like an important short term level to me – below there we are headed back to the recent lows around 1.1280/1.1300. GBPUSD must hold 1.2916 to avoid another 1 cent fall. This chart speaks for itself – at the 38.2% retracement level the easy money has been made. I’ve dragged my stop down but am still giving this room to break because the MACD system and Wednesday’s candle suggests it will. Elsewhere USDCAD and USDSGD are higher which I’ll take as confirmation of the US dollar move because China and Chinese flows are largely absent at the moment. Continue to watch these three though as the lead indicators for the Greenback. With CAD and SGD on the back foot a little USDCNH above 6.7850 would further aid the Greenback. 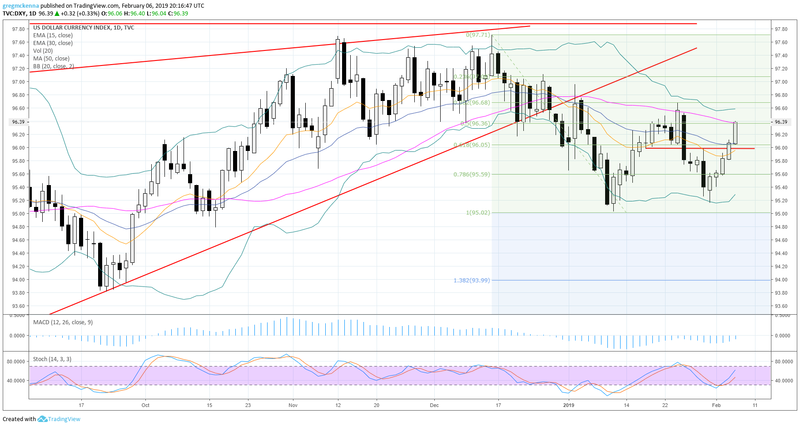 Oil is looking a bit like USDSGD did for an extended period where it hung and hung before dipping back toward the 38.2% retracement level of the most recent move. It’s up today after 2 down days and still firmly in the range between $50.40 and $55.45/50ish. The 15 ema continues to be supportive, and unless that breaks there is little point getting too bearish. But even with an up day, the price action, the MACD, and the stochastics suggest oil is going lower. $52.30/50 which holds the SAR and 30 ema is also supportive. Fundamentally the EIA stockpile data had a bit for everyone in it – a build in Cushing to take inventories to the highest level in a year might be seen as brearish for oil. But the distillate numbers and the lower than expected build in the headline crude inventory of 1.26 million barrels instead of the 2.179 million expected helped prices recover from the days low. There’s also a lot of chat about the OPEC Russia tie up being formalised but as I noted yesterday and last year the Russians have said not to this. So we’ll see. Brent i sin a similar technical position to WTI, back above the 15 ema with it and the 30 ema providing support. Below $60.85 looks like the bull/bear delineation point within the range. Gold looks to be rolling back toward support at the breakout level of $1,298/1,300 after Tuesday’s inside day gave way to selling Wednesday. If $1,298 gives way then we’ll be looking at a much deeper fall maybe even back to $1,280. Copper reversed away from the channel top Wednesday posting a high around $2.845/7. As I noted yesterday this range top is going to be formidable resistance here above $2.80 a pound. So I’ll respect it unless or until it breaks. Looking to sell soon. The Aussie looks set to head back under 70 cents after RBA governor Lowe clarified what the changes to the statement ACTUALLY implied. As I Tweeted during the speech, “This is classic #RBA pragmatism from Lowe Changing tack, set the scene to act if their outlook is wrong As Lowe says, “The question is: what effect will this [house price falls] change have on household spending?” Indeed – I think it will hurt “. And that’s the point. In the same way as the Fed flipping dovish gave traders an opportunity to exercise their bearishness on the US economy – so far unrequited love – so too did governor Lowe in signalling changed thinking at the RBA free the bears up to push the Aussie lower – across the board. A 1.73% loss against the USD with moves from -0.8% against the Kiwi through to -1.7% against the the Yen the Aussie is under pressure. Which is exactly what the RBA govenor had in mind when he said (my bolding), “we cannot insulate ourselves completely from the global risks, but keeping our house in order can go a long way to assist. Our floating exchange rate and the flexibility we have on both monetary and fiscal policies provide us with a degree of insulation”. That’s left the Aussie under pressure and below the recent wedge bottom. 0.7075 fractal is the next support and then its the 0.7015/20 region. Resistance is 0.7050/75. Here’s the daily chart – I’m still short. As highlighted yesterday the local market’s analog with the US means we are in the zone where the rally on the ASX has some equivalence with the bounce in US stocks – using the S&P 500 as a bellwether. That’s partly why I didn’t really expect much give back on the local market yesterday – all the ASX has done is play catch up. Traders added 20 points on the physical and then SPI traders (at 6am my time, 2pm New York have added another 28). That means prices is up and through the 200 day moving average in both SPI and ASX cash terms. Based on the technicals that means the SPI is biased toward 6071 on a pure Fibo extension basis. But I was looking at an old ASX 200 cash chart on Reuters and realised there is an old channel bottom lurking overhead. It’s the channel bottom from the 2016-2018 up trend. On the SPI weeklies it comes in at 6045/60 at the moment (weird but the dailies and weekly versions give me different numbers, hence the zone). On the cash ASX it’s at about 6,071. So we are in the zone folks – here’s weekly SPI. Naturally given this price action recently I have no actual sell signal at the moment. SIGNALS – I’m short AUDUSD, GBPUSD, EURUSD, WTI, and Gold . My brokers don’t trade DXY but I am theoretically long now. Spreadsheets will be rerun at the end of New York trade – 9am my time for new signals. The Fed has UTTERLY blinked – we can almost ignore good US data, should it come – with this backdrop. This provides a constructive backdrop for risk. So, not fighting it as I have I have no actual sell signals now for stocks as the rally in the SPI has negated that one now. I looking to get short now…waiting on my MACD system. China is stimulating – that is is positive too though their data is awful and sliding a little still. Global growth is slowing –Stocks don’t care though. The USD is just in a big old range. Structurally a USD bull, tactically cautious. Bonds are in a 2.55%-2.82% range a break either side would be a very important signal for markets more broadly. Holding below 2.82% is a bullish sign for risk assets . But if 2.55% range low were to break that would be a bad signal for risk assets. Above 2.55% for the 10’s is kind of Goldilocksy. Gold and silver look more cautious short term at present. Oil has now tested the 38.2% level in WTI terms and the reversal confirms that for the moment it is in a big old range and only a break of resistance at the 38.2% retracement of the big fall would kicks things higher. Watch this zone of support.